Golf Balls, Stock up and Save! A comprehensive session covering all facets of greenside management to include…pitching, chipping, bunker play, lob shots, bump n' runs and putting. Learn the importance of assessing the shot, selecting the proper club and using the correct technique to help you successfully execute the shot at hand. This program will help you avoid the mistakes which most golfers make around the greens and thus shave strokes off your score! Learn how to manage your game from Tee-to-Green with on-course Professional Golf Instruction. This program is designed to help you successfully take your game from the practice tee to the golf course. Learn the importance of how to approach each hole with a positive game plan and get the most out of your game by mastering the fundamentals on the course one shot at a time. Take advantage of utilizing the strengths of your game soyou can eliminate the negatives and execute each shot with confidence and be on your way to playing better golf! "BIRDIE" PACKAGE ~ Your own Private Golf School right at home…no need to travel to Florida! Combine all three programs and get 6 1/2 Hours of "personalized" Professional Golf Instruction for $500**. This flexible package allows you the convenience of scheduling your sessions based upon your busy lifestyle. This will give you the chance to practice between sessions. Unlike the traditional week-long golf school, this program will allow you the time to build upon your attributes and retain both the physical and mental aspects needed to build your skills and enjoy the game to the fullest! *Learn*Practice*Perform* ~ Take your game to the next level…one swing at a time! 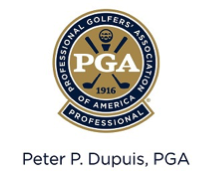 Please call (603) 913-4692 or Email pdupuis@golfmanagementco.com for more information on scheduling lessons with Peter P. Dupuis, PGA Professional.